Reliable, science-based information is essential to ensuring the Utah Department of Environmental Quality (DEQ) makes the best possible decisions and fulfills its mission to safeguard Utah’s air, land, and water. We use the data we collect to protect and inform the public, verify compliance with regulatory standards, and collaborate with local and national universities and partner agencies on research projects. To make sure we have quality data, we need a quality facility to conduct our analytical work and store our equipment. So you can imagine how excited we are about the upcoming construction of a new Technical Center that will allow us to do all that and more. Our current air-monitoring facility, located in West Valley City, is housed in a retrofitted warehouse not designed for laboratory use. Temperature and humidity control is crucial to ensuring our scientists can collect accurate data, and the conditions at this location present our staff with constant challenges. We have some safety and security concerns with the current facility, and we lease rather than own the building. Our air-monitoring scientists must drive back and forth between the facility and our office — not optimal when we’re trying to reduce employee trips and emissions to improve air quality. We knew we needed to upgrade our facilities for some time, but receiving the approval to construct a new building is a lengthy process. We approached the Utah State Building Board almost ten years ago, and it took many more years — and many more proposals — before our project rose to the top of the list. In 2015, the Utah State Legislature appropriated $6 million for the design and construction of a technical support center that will be located on state-owned land just around the corner from our office. The new, 21,500-square-foot building will contain multiple labs, storage for scientific equipment and vehicles/boats, and areas for sample preparation and analytical work. The main occupants will be air-quality scientists from our Air Monitoring Center, but all five divisions have spaces designated for equipment storage and ancillary lab work. Air-quality scientists will have new warehouse space to build and repair mobile monitoring stations as well as separate labs for analyzing particulate and gaseous contaminants. Most importantly, they will have a “filter room” stabilized for temperature and humidity to analyze air-quality filters, analysis that is critical to fulfilling our statutory responsibility to meet National Ambient Air Quality Standards (NAAQS) and track our progress in reducing pollution. While the other four divisions use the Utah Public Health Lab to test and analyze the majority of their samples, they will now have space for sampling preparation and limited analysis. The Division of Water Quality (DWQ) moved to an improved facility a few blocks away from the DEQ offices seven years ago, but even water-quality scientists will benefit from the tech center’s amenities. The Division of Waste Management and Radiation Control (WMRC) will have a lab with small calibration and reference sources to calibrate instruments to verify they are functioning properly before use. The Division of Drinking Water (DDW) and Division of Environmental Response and Remediation (DERR) will also have space to store their sampling equipment. Consolidation of our activities into one building allows us to be more responsive to the public and regulated community. New lab facilities improve the efficiency and ease with which our employees do their work and eliminate a time-consuming commute to an offsite facility. State-of-the-art lab labs ensure the accuracy of our internal testing and analysis, which in turn improves our protection of public health and the environment. Centralized space that meets the needs of all our divisions streamlines our work, reduces travel time to outside facilities, and protects valuable scientific equipment. The final design for the facility will be completed later this summer. Representatives from all five divisions have been involved in the planning and design to ensure the new building meets everybody’s needs. We plan to go out for bid as soon the design is finalized and award a contract in September, with construction set to commence soon after that. We anticipate the building will be completed by December 2018. We will keep you updated on the changes happening at DEQ’s Technical Center, changes that will ensure the quality of the data we collect and the accuracy of our science-based decisions so we fulfill our commitment to you and your family to safeguard our state’s air, land, and water. I started my career as a scientist in the Hazardous Waste Program in 1983. Since then I have worked in Superfund, Underground Tanks, Federal Facilities, Emergency Response, Voluntary Cleanup and a few other miscellaneous programs along the way. I am currently Deputy Director of DEQ. I enjoy about anything that can be done outdoors. 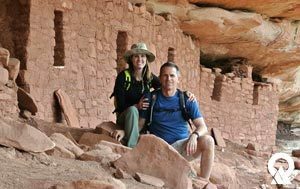 My wife Annette and I recently spent a few days four wheeling and hiking in the spectacular Bears Ears National Monument. I also enjoy spending time with family and I am the proud father of 5 children, ages 21 – 29, and one granddaughter, age 9 months.